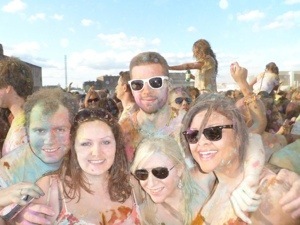 While Holi festival is traditionally in March many festival organisers organise celebrations in June, to fit in with the British weather. 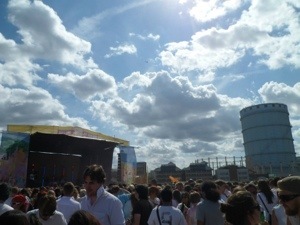 Having experienced the Battersea celebration in London last year I thought I would write a review to help anyone thinking of going to similar events this year decide if the price is worth it. Fortunately for me I scored tickets on Wowcher and saved 70% of the cost. 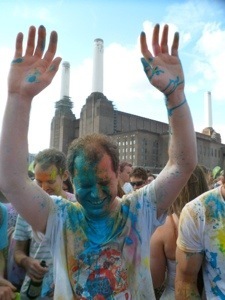 Firstly I should mention that the British musical celebrations of Holi are not in any way cultural or religious. They are essentially one massive piss-up photo opportunity accompanied by cheesy chips and dance music! We did see a few families arriving and they were disappointed, it certainly is an 18+ occasion. Secondly it is – as with most gigs/festivals/events – what you make of it. 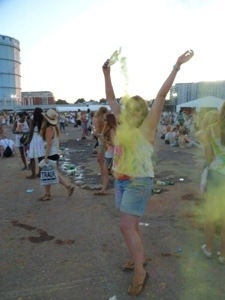 If you feel like a fool raving in a car park outside a power station breathing in masses of coloured dust, it isn’t for you. If you can let go chill out, dance and laugh with friends it can however be an amazing day. 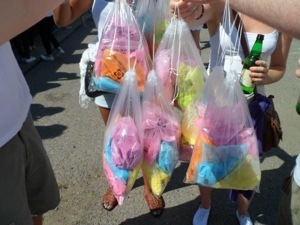 My top tips would be always buy tickets from a discount site, and always buy the maximum number of colour bags before you enter as they are prohibitively expensive inside. Finally, wear sun cream!